You will agree with me that most of the treasured holiday memories are happening at the festive dinner table. No matter what will be the theme of your table setting this Christmas, make sure it’s cheerful and it shows your personal style. I decided to start with something that can easily go to your collection of homemade Christmas centerpieces. It won’t take long to make, all you need is a tall glass vase, some evergreens from the backyard, and a bunch of shimmering Christmas ornaments (you can steal them from the Christmas tree). 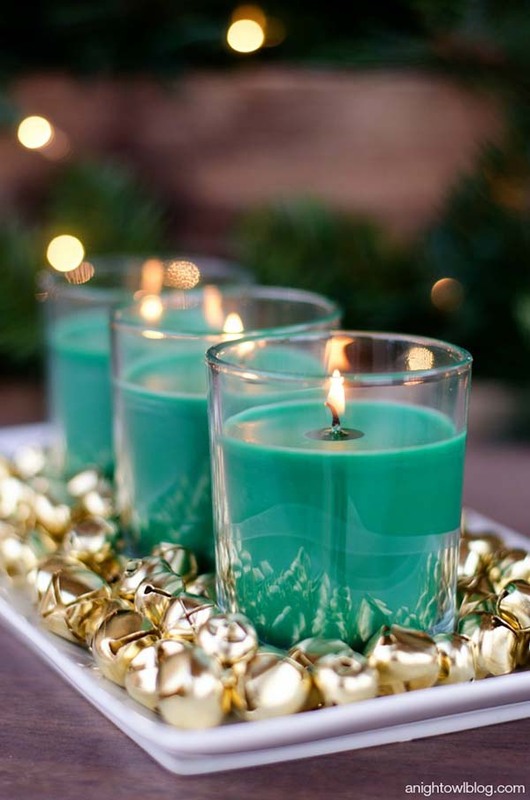 Be creative and customize this idea in a way that fits the rest of your festive decor. 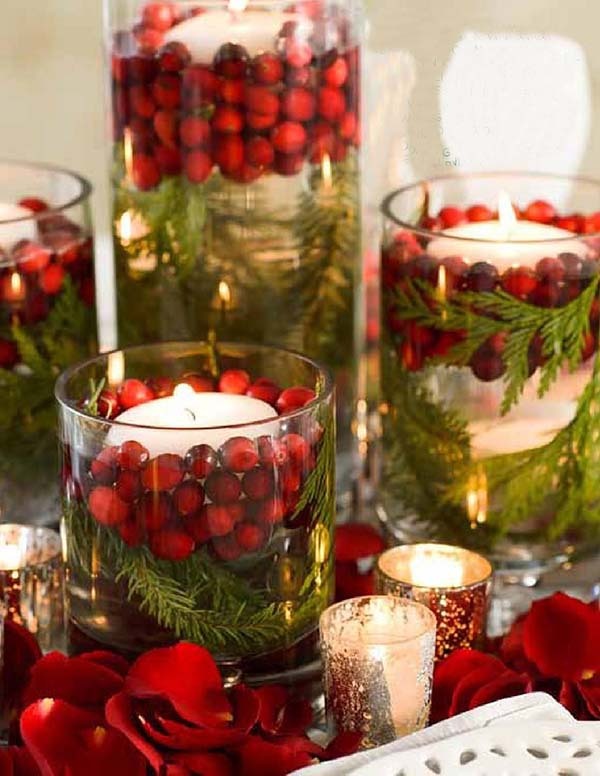 As I am a huge fan of the Christmas centerpieces with a candle, I was very happy when I found this creative tablescape. 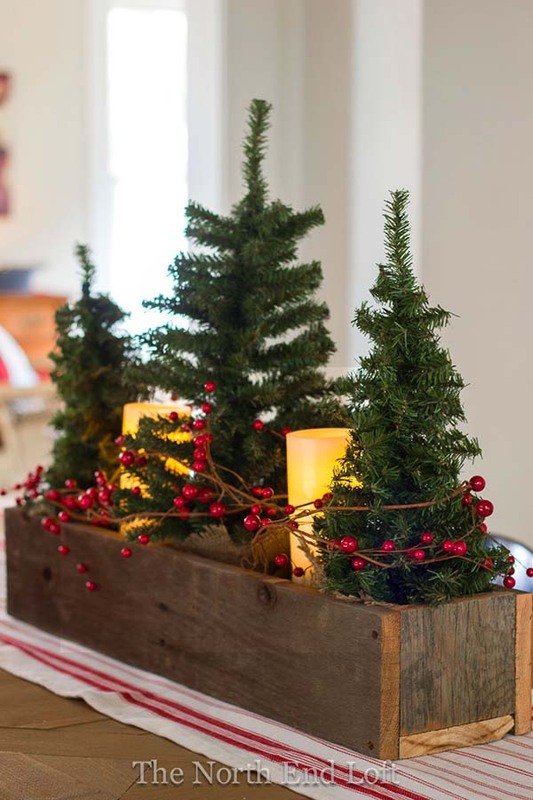 You can also do it – just buy an old wood box from the thrift shop (or make one) and fill the box with tiny faux trees, a cranberries garland, and some candles. I love the rustic vibe this setting brings to the dining room! In just ten minutes, you can design these charming luminaries using upcycled jars, cranberries, cedar clippings or some other greenery, and a bunch of floating candles. 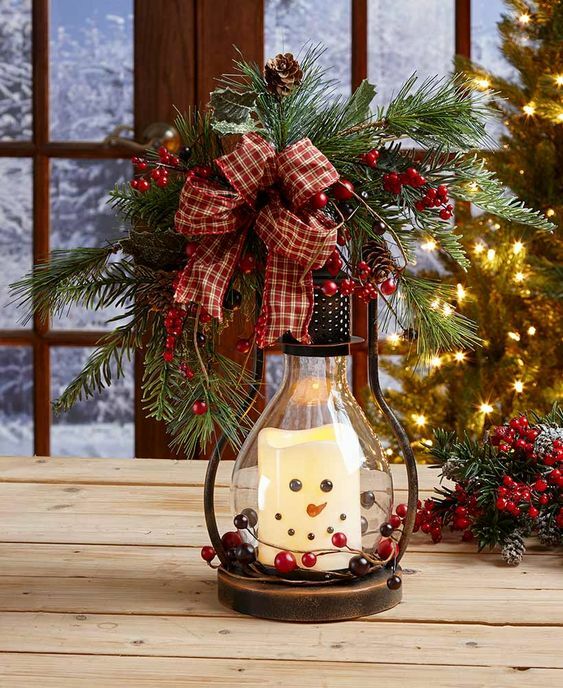 Last week, my sister asked me to find some beautiful and easy Christmas lantern centerpieces for her. 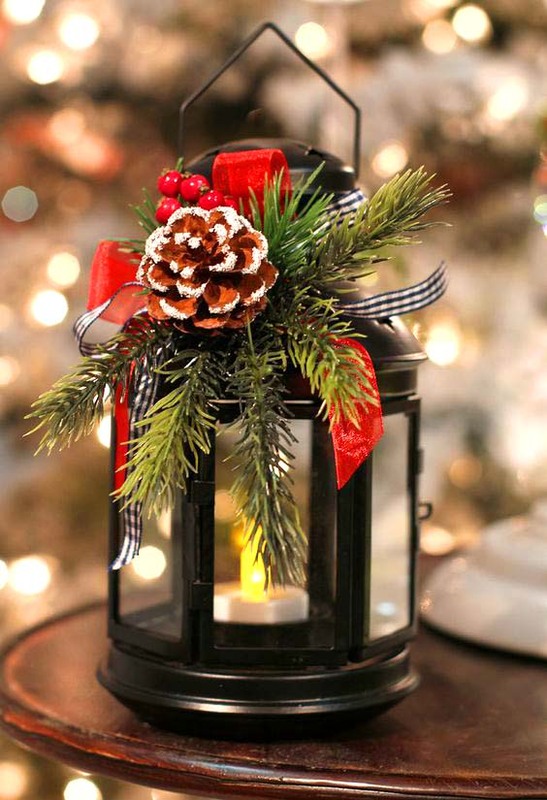 And what could be easier than decorating some old lanterns (or buying new ones from the dollar store) with classic holiday elements such as evergreens, red ribbons, and mini frosted pinecones? It’s essential to remember we don’t need to necessarily spend a fortune to create a stunning table centerpiece. The cheap Christmas centerpieces are usually better than the expensive ones because they are (partly) handmade and they show our own artistry. 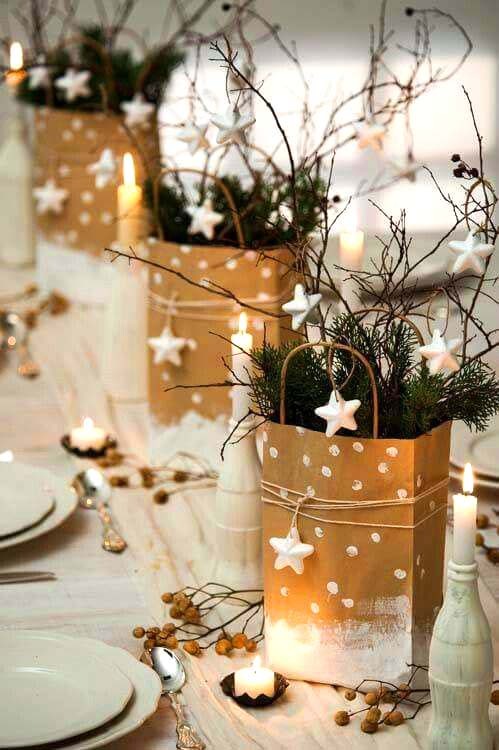 for instance, transform plain paper bags into festive flower holders for an artistic organic holiday table centerpiece on a budget. 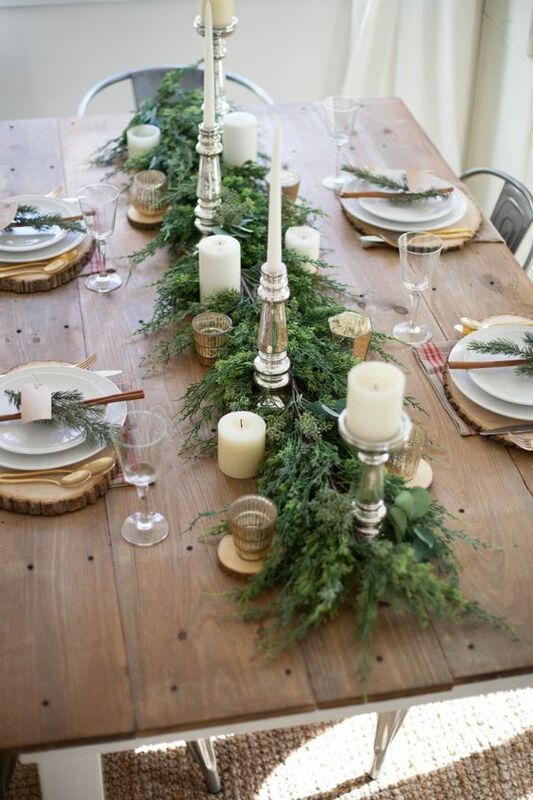 Save tons of money this Christmas and create a large table feel full by harmonizing a mixture of pieces foraged from the outdoors like bundles of fresh pine and some vintage candleholders in various sizes to add texture. 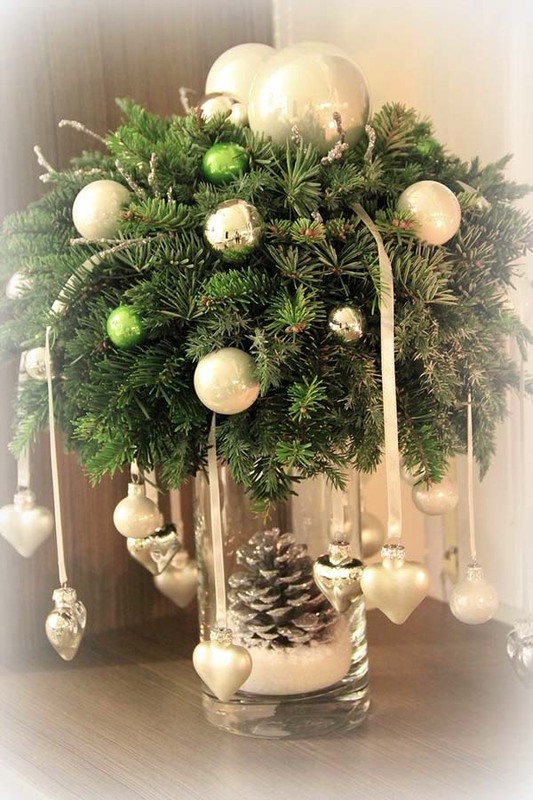 I think the more organic the more elegant and nature-inspired Christmas centerpieces are. 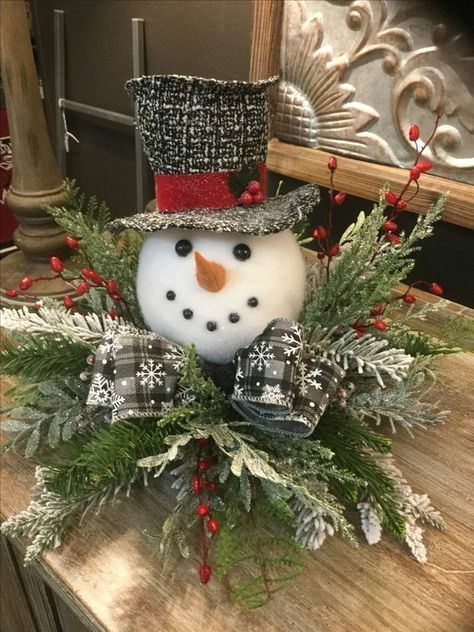 As Christmas holiday is all about the joy and the fun, memorable family gatherings, my advice is to create some Christmas centerpieces that can make everyone smile. Let nature be the focal point in a Christmas floral arrangement that’s also a great conversation starter. To add a little twist to the festive dinner table, bake cookies with each of your guest’s name. In this way, you’ll make everyone feel more special and cozy in the Holly night. 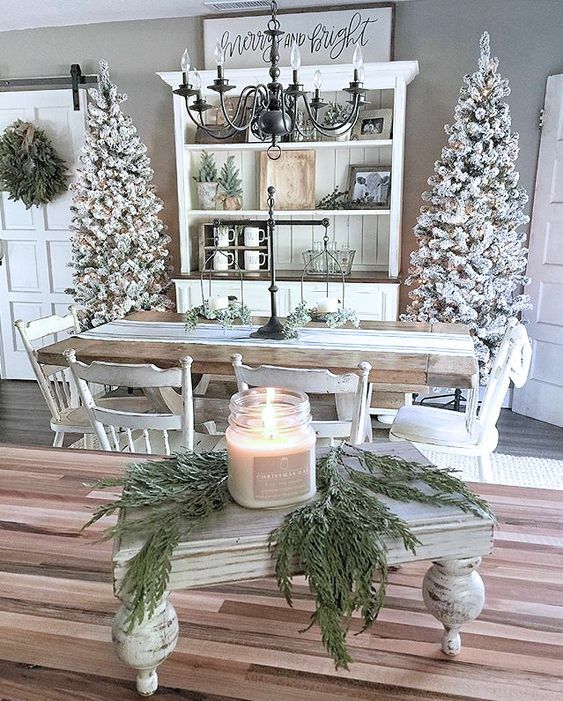 Following the list of easy Christmas centerpieces ideas, celebrate the charm of the holiday with this marvelous mix of fresh pine evergreens displayed around a large glass candle jar. The whole decoration looks so unpretentious, elegant, and rustically comforting. This is one of the ideas of mason jar Christmas centerpieces I used to look at many times but this year I finally decided to give it a try. I first thought it would be a very hard DIY project, however, if you read the step-by-step tutorial carefully it is not. The materials needed here are mason jars (simple glass jars also work), Epsom salt, mod podge, and a brush to apply the mod podge. This DIY snowman will be the focal point of your festive dinner table with a few thronged pine boughs, snowball head, and chic tartan ribbon bow tie. In case you have some doubts, I would ensure you the kids at home will love this smiling fellow. 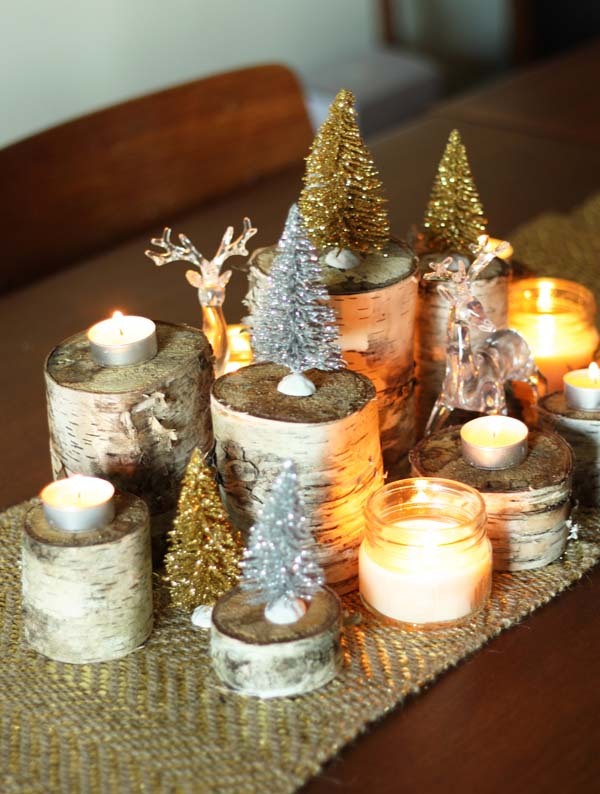 This simplistic, organic table setup requires just three kinds of pieces: birch stumps, tea lights, and shimmering Christmas figures. You can also display some glass jars in order to give some texture to this centerpiece. It doesn’t get much easier than that! Arrange the elements according to your own taste. This is an easy and simplistic way to make a remarkable centerpiece for your Christmas dinner table. I love the contrast between the golden elements and the candles. 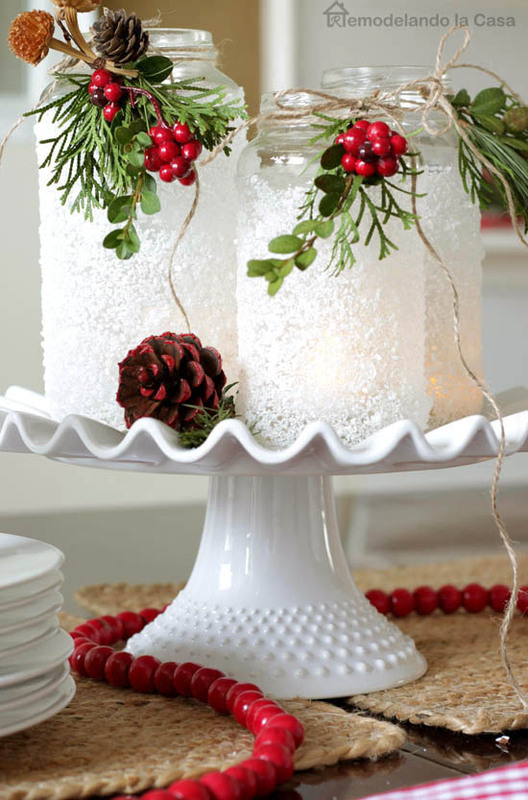 This Christmas dough bowl centerpiece is made of an ancient dough bowl. To me, it looks a bit as Santa sleigh. 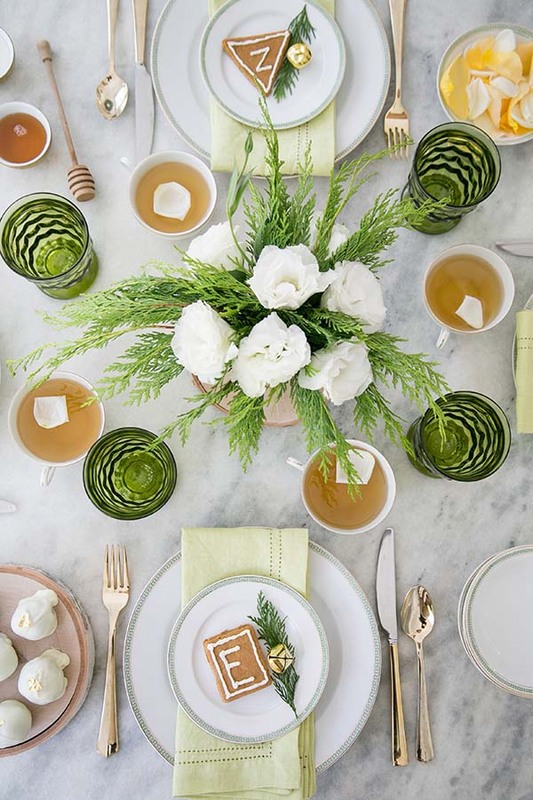 No one can guess how simple this charming, natural-looking Christmas table decoration is to make! All you need to do is to collect some pinecones, wooden pieces and moss from the nearest park. 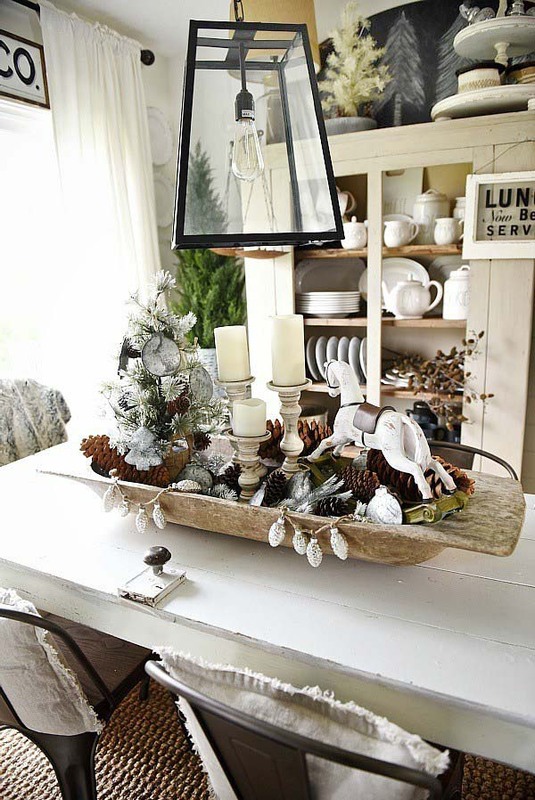 Plus, this is one of the rustic Christmas centerpieces you can display for the whole year. Santa is one of the most symbolic Christmas figures. That’s why there are so many Santa-themed Christmas table decorations centerpieces. 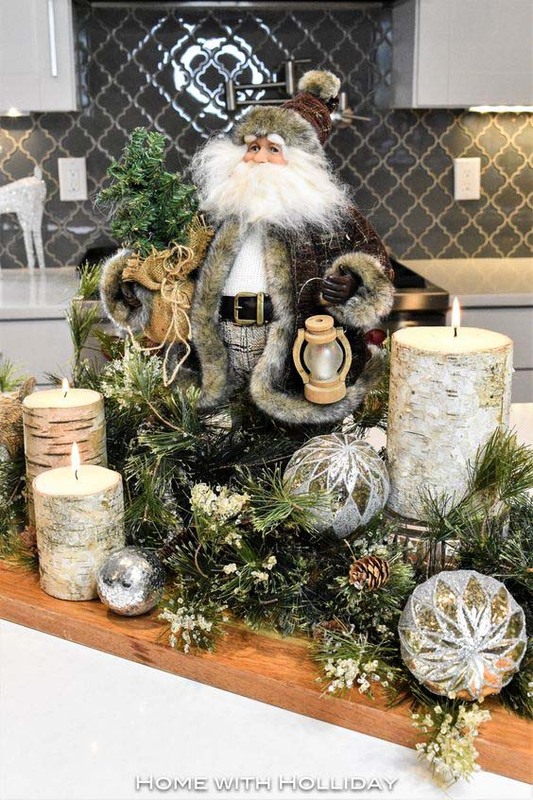 For this one shown above, you’ll need evergreens, birch logs, candles, large shimmering ball ornaments, some candles, and a large Santa figure as a focal point of this eye-catching centerpiece. 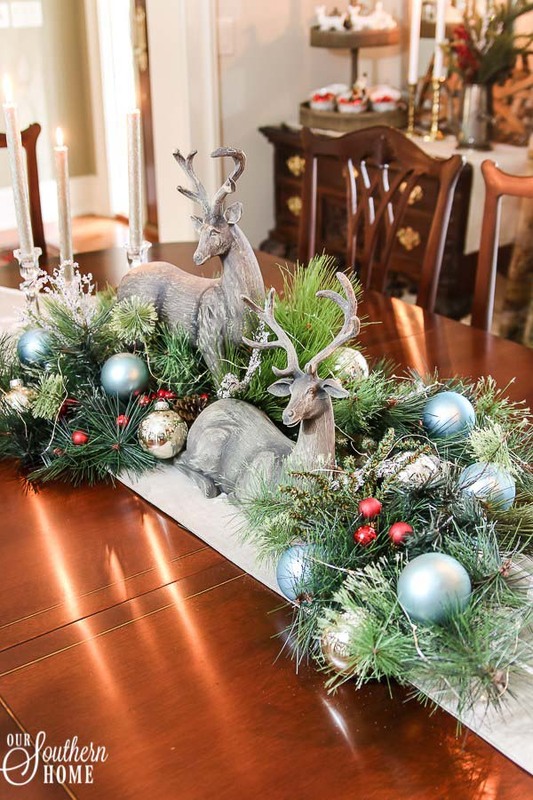 This Christmas table design starts as a simple DIY project. Simply create a display of paper trees in gold. 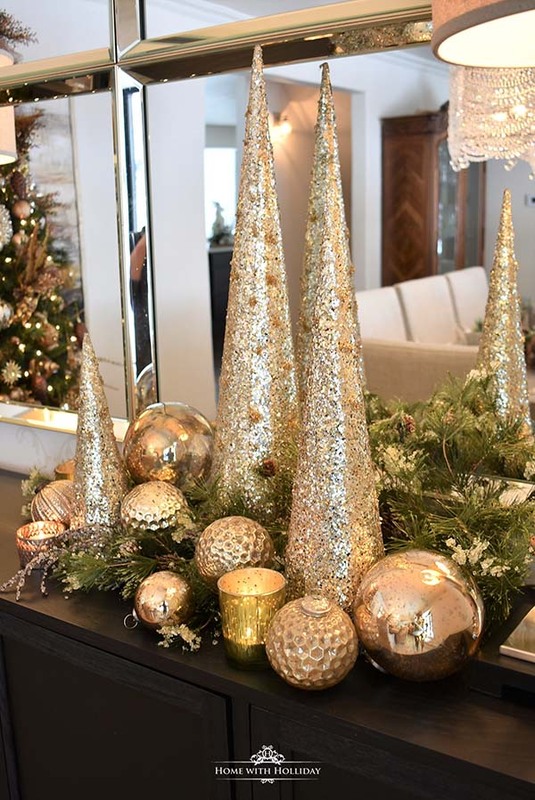 Display the shimmering decorative trees along with some golden ornaments and a bunch of tea lights candleholders to give the setting more texture. And there it is – your Christmas centerpiece is ready! I left one of my most favorite Christmas centerpieces ideas for the end. 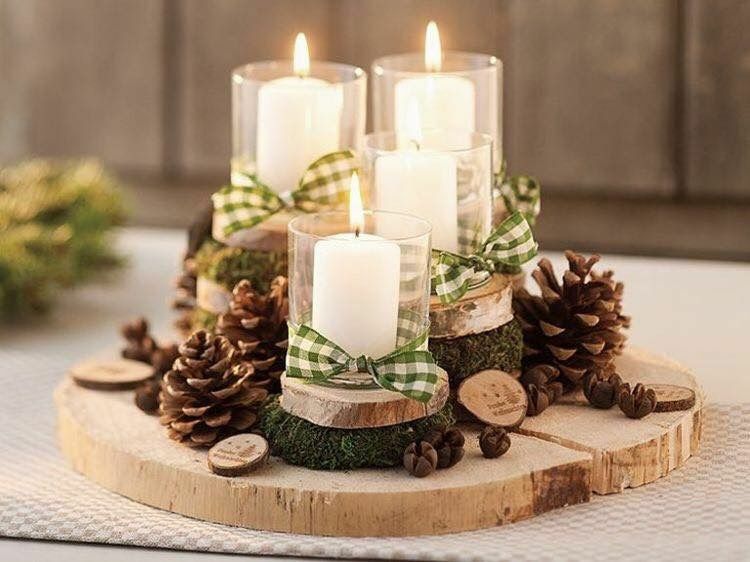 For those of you who believe the essence of Christmas coziness is found in a mountain chalet style of Christmas decor, do not hesitate to create this gorgeous holiday centerpiece.